Let’s talk bagels and knives. The combination is deadly”¦well, at least for fingers and hands. I would hazard a guess that avocados and bagels cause the most knife injuries in home kitchens. I have ZERO data to back me up on that claim, but that’s what I my gut tells me. And I have smart guts. ANYWAY”¦I have already shown you how to cut avocados the awesomest most safest way ever. But until this week I didn’t actually know the safest way to slice bagels. But now I do. And so, of course, I am showing you! We have a really great bagel shop down the street where I get bagels for my kids’ lunches. (PS: The bagel shop is called Top of the Bagel and it is seriously good – New Jersey native approved!) I like to buy a dozen bagels at a time, slice them, cut them in half and then put the bagels in the freezer so they are fresh for lunches. This week, as I was prepping the bagels for the freezer, I had a revelation. I used to always slice the bagel (you know, like when you slice it to put in the toaster or spread with cream cheese) then cut it in half (my kids only eat a half a bagel for lunch). This week, however, I reversed the cutting order, cutting the bagel in half first and then slicing it. You guys. This way is so much easier and safer. How have I never thought of it before?!? From now on I will always do this, even if we are planning to eat the whole bagel. I will describe in detail what I’m talking about so there is no confusion and to ensure the survival of everyone’s fingers. 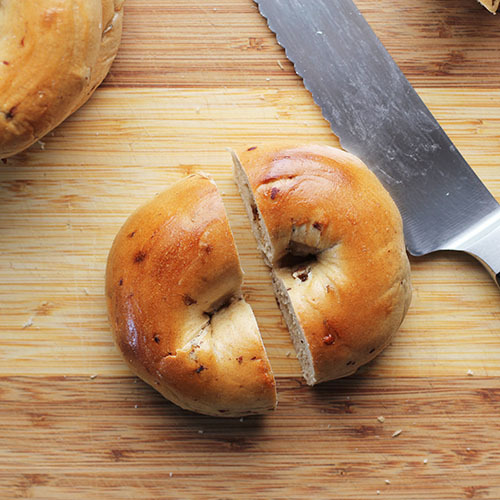 Step 1: Cut the bagel in half, as shown in the photo below. Step 2: Slice the bagel. To do this, when you place the bagel vertically on the cutting board to slice it, put it cut side (flat side) down on the board. 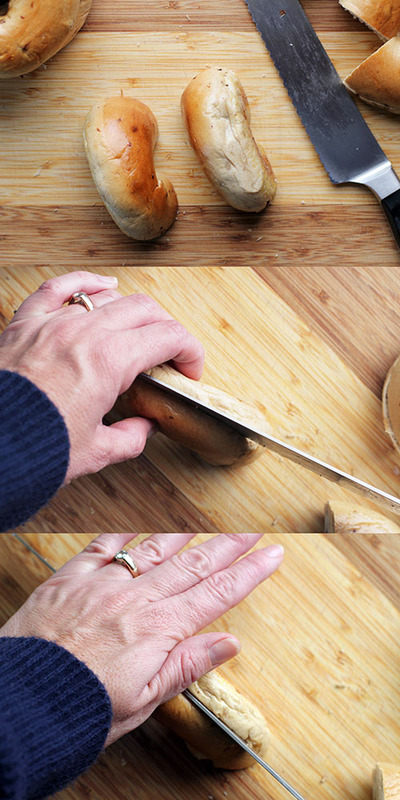 Start to slice the bagel, pinching the top of bagel and holding it firmly with your non-knife hand. 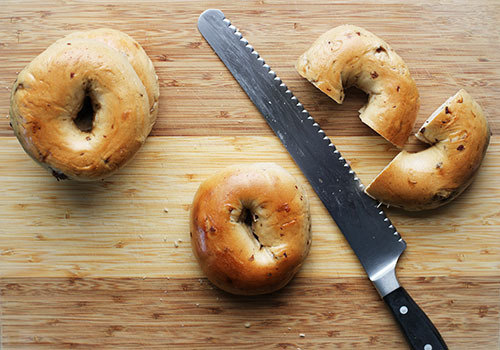 As soon as the top of the knife is level with the top of the bagel, flatten your hand and press down on the bagel to hold it in place. It works like a charm and never at any point is your hand or any of your fingers in way of the blade. This is not rocket science, I know. And it was one of those “Duh!” moments for me and it is seriously helpful and so much safer. So, there you go. Happy bagel slicing! Buns of all sorts are very common to eat in Sweden and my husband slices through them like a pro and I am horrible at it and did once cut myself so now I am going to try this technique and see if I am be a pro too! Brilliant. Now I need to read your avocado post because I’m guessing my way might not be OSHA approved…..